Michel Platini hit the presidential campaign trail early with a proposal to extend the World Cup finals to 40 teams. The UEFA president is ambitious about succeeding Sepp Blatter as FIFA president, and obviously sees inviting more countries to world football’s most prestigious tournament as a vote winner. He isn’t sweating the small stuff right now. Until as recently as 1978 the World Cup featured just 16 finalists. An increase to 24 and then 32 nations has made the tournament longer and with duller games. Adding another eight nations to the mix would also make it far more difficult for smaller nations to envisage hosting such a bloated tournament, but Platini wasn’t too worried about the details. The problems an expanded World Cup would create are secondary to FIFA’s power struggle. While Blatter wants to get more African and Asian countries involved in the finals (thus increasing the sponsors’ marketing reach), Platini wants to protect the interests of the European nations. "I totally agree with Mr Blatter that we need more African and Asian teams," Platini said. "But instead of taking away some European, we have to go to 40 teams. We can add two African, two Asiatic, two American, one Oceania and one from Europe." His format for the larger tournament would feature eight groups of five nations, creating far more group games, although he claimed it would only add three days to the tournament. "Football is changing," Platini said. "We have 209 associations, so why reduce? Make more people happy." Making more FIFA delegates happy, the cynics might respond. The next FIFA presidential elections are looming in 2015. 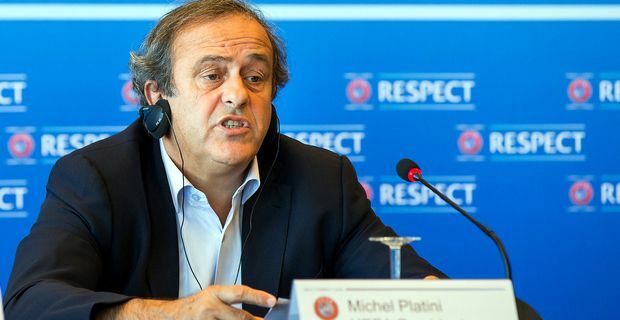 Although there were rumours that Blatter was ready to retire, it now seems likely that he will stand for re-election, with Platini as his main challenger. Asked what Blatter thought of the Frenchman’s expanded World Cup idea, Platini replied: “I haven’t told him yet."